Soulful, sultry singing sensation Sade Serena is poised to take the pop world by storm. Birthed on September 27 to Jamaican immigrant parents, the Miami-born and bred starlet’s foray into music is inevitable, as she exhibits sheer unbridled talent framed with gorgeous looks, destined to make her a force to be reckoned with in pop music. Sade Serena fatefully entered the rhythmic realm at the tender age of 12, recording a demo with a family friend named Rhovan, after receiving much encouragement to sing for years. "Lo Tienes (You Got What I Want)” was the name of the faithful track, and although the song was never officially released as a single, it granted Sade Serena invaluable recording experience, along with her first taste of lyrical liberation. By age 17, Sade Serena was earning her stripes as a background singer, performing in renowned Miami music venues like the House of Blues and the American Airlines Arena. “As my hunger grew for my own spotlight, I started singing lead vocals for local bands at lounges such as Mangos in South Beach, and even in hotel lobbies like The Ritz Carlton.” Maturing over the years into a seasoned singer and songwriter, Sade Serena makes music that flows from her soul. Her lyrics showcase her exuberance, intelligence and charm, as she shares a relatable narrative of pursuing her dreams, along with her everyday life experiences. “My music captures those moments in your mind that make you feel happy and confident in the real you. I want to be a storyteller and spread love with my himself an aspiring artist, and mother, who Sade says never fails to let the world know her daughter is a star. Her other inspirations include musical luminaries Whitney Houston, Michael Jackson, Gwen Stefani, Beyonce and Lady Gaga, all of whom captured the ears of this auspicious artist and contribute to her melodious pop sound. “I want to be currently retro, in that, I like incorporating my love for old school music, which I grew up listening to, with music that I listen to today. 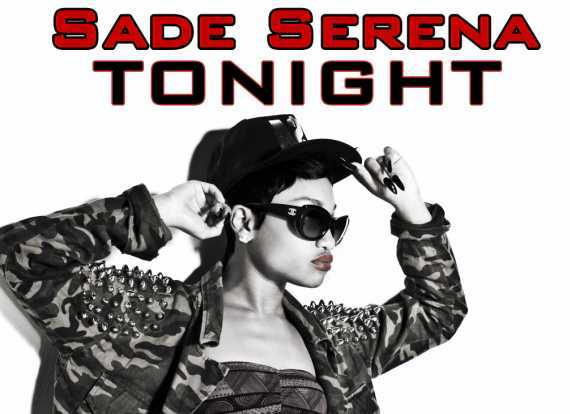 Now under the management of Uprize Music, Sade Serena emerges with her first single “Tonight,” a sizzling pop-dance offering that debuted worldwide in February 2013, from Def Jam Digital Distribution. Sade is proving to be a dynamic entertainer with her relentless work ethic and boundless creativity, which will undoubtedly propel her to the forefront of music’s fast lane. Indeed, this pop princess is paving her way, with each beat and lyric, to her very own throne.